Henry Stoddart was born on September 27, 1834 in Selkirk, Scotland. Jane was born September 8, 1834 in Dyke and died May 30, 1891 in Scotland. After her death Henry followed his family to Copper Cliff. Henry Stoddart died April 4th, 1902 in Copper Cliff, Nipissing District. Harriet Alice Stoddart married Alexander 'Sandy' Roderick McDonald of Copper Cliff. 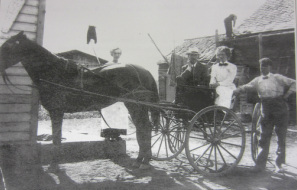 Left Jane (Stoddart) Thomson, in carriage Sandy and Harriet (Stoddart) McDonald, Right John Thomson in Copper Cliff about 1908. Ancestry and Descendants of Henry Stoddart and Jane Smith. Harry Robert Stoddart, in England shortly before being sent to France. Ancestry and Descendants of Henry Stoddart and Jane Smith. Henry and Jane’s son Thomas Stoddart arrived in Sudbury in 1890. He was born 7 Jun 1866 in Old Machar, Aberdeenshire and died 11 Aug 1939 in Copper Cliff. Thomas married Euphemia (Effie) Barbara Pitt on February 18, 1891 in the Rainy River District, Rainy River, Ontario. Effie was born 22 Aug 1874 in Westmeath, Ontario. 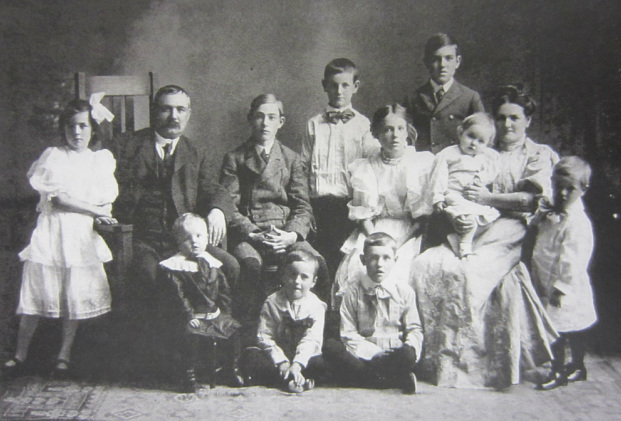 Thomas and Effie had 14 children, born in Copper Cliff. Thomas was a Canadian Copper Company miner and paymaster, Sudbury District magistrate and coroner, musician and he loved fishing. In June 1904 Thomas was appointed as a notary public. From the 1911 Census of Copper Cliff, 30 Granite Street: Thomas Stoddart, age 34, married, immigrated in 1890, paymaster, his wife Effie Barbara Stoddart, age 35, son William Harry, age 19, timekeeper, son Thomas, age 17, son Earl, age 16, Audrey, age 15, son Cecil, age 13, daughter Arethusa, age 12, son Gerald, age 7, son Ernest, age 6, son Almon, age 4 and son James Gordon, age 1. Thomas and Effie’s son William Harry Stoddart was born in 1892 in Copper Cliff; he was an accountant and company treasurer. Thomas Stoddart was born in 1893 in McKim Township; he enlisted on March 10, 1916, served as a gunner in World War I and was commissioned in the Royal Air Force in 1918. Peter Alexander Earl Stoddart was born in 1895 in Copper Cliff and served in the First World War. In 1914 Peter lived at 130 Rink Street. Audrey Blanche Stoddart was born in 1896. Augus Cecil Lawrence Stoddart was born in 1897 and served with the 159th battalion in France and Belgium. Arethusa (Toddy) Margaret Stoddart was born in 1899. Elizabeth Wilvina Stoddart was born in 1901 and died in 1902. John Thompson Stoddart was born in 1902 and died in 1909 from eating poisonous berries. Gerald Roland Stoddart was born in 1903. His twin Geraldine lived for 2 months. Ernest Stoddart was born in 1905. Russell Almon Stoddart was born in 1906 in Copper Cliff and was with the accounts office at Inco. Zoe was born in 1908 and lived for 2 months. Gordon James (Mickey) Stoddart was born in 1909 in Copper Cliff. Thomas Stoddart lived at 30 Granite Street in 1914.